Do you love working out and rather than endless sit-ups, would like a super convenient way of performing back, stomach and core strengthening exercises? Ideal for the home gyms, our Exercise Balls are manufactured from ultra tough, burst resistant rubber, perfect for tough or weighted exercises, with a non-slip surface for safe, everyday use. Perfect for both men & women, our Exercise Balls are available in 45cm, 55cm, 65cm, 75cm and 85cm diameters and blue or black, for easy co-ordination with other workout equipment! - Perfect for strengthening the abdominals, core and lower back muscles. - Manufactured from burst resistant, durable PVC, perfect for tough workouts. - High grip, non-slip surface for safe use when performing weighted exercises. - Perfect for use with yoga, pilates, or for general strengthening & balance. 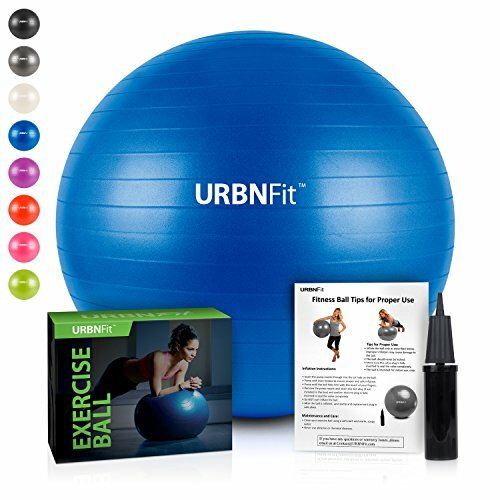 If you're tired of endless sit-ups and would like a professional quality, ultra durable, burst-resistant exercise ball, perfect for tough workouts and everyday use, our Exercise Balls are the ideal choice for beginner and advanced use! If you have any questions about this product by URBNFit, contact us by completing and submitting the form below. If you are looking for a specif part number, please include it with your message.